Today marks the 48th anniversary of the 1967 U.S. Supreme Court decision Loving v. Virginia, which struck down all anti-miscegenation laws remaining in 16 states. Interracial marriages have increased steadily since then. Looking beyond newlyweds, 6.3% of all marriages were between spouses of different races in 2013, up from less than 1% in 1970. Some racial groups are more likely to intermarry than others. Of the 3.6 million adults who got married in 2013, 58% of American Indians, 28% of Asians, 19% of blacks and 7% of whites have a spouse whose race was different from their own. The overall numbers mask significant gender gaps within some racial groups. Among blacks, men are much more likely than women to marry someone of a different race. 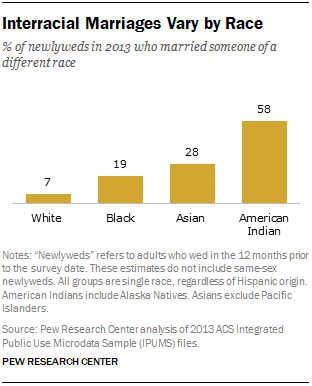 Fully a quarter of black men who got married in 2013 married someone who was not black. Only 12% of black women married outside of their race. For Asians, the gender pattern goes in the opposite direction: Asian women are much more likely than Asian men to marry someone of a different race. 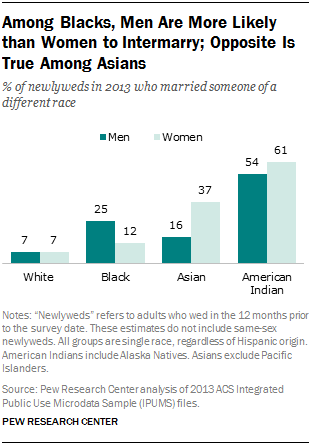 Among newlyweds in 2013, 37% of Asian women married someone who was not Asian, while 16% of Asian men married outside of their race. American Indians have the highest interracial marriage rate among all single-race groups. Women are slightly more likely to “marry out” than men in this group: 61% of American Indian female newlyweds married outside their race, compared with 54% of American Indian male newlyweds. The trend toward more interracial marriages is undoubtedly related, at least in part, to changing social norms. Our previous surveys have documented growing acceptance among the public. In 2014, 37% of Americans said having more people of different races marrying each other was a good thing for society, up from 24% four years earlier. Only 9% in 2014 said this trend was a bad thing for society, and 51% said it doesn’t make much difference.